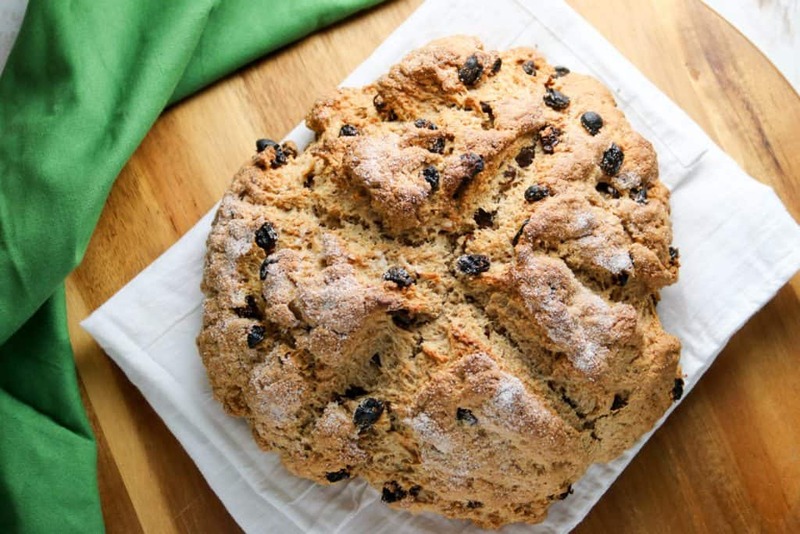 Celebrate St. Patrick’s Day with this whole wheat Irish soda bread recipe. 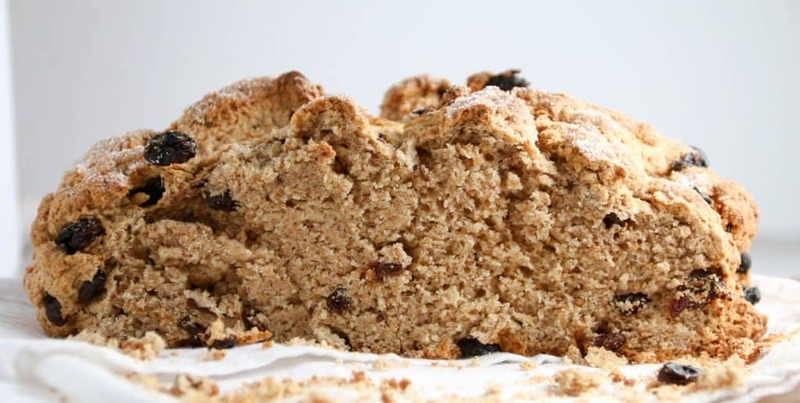 This is a classic Irish soda bread made with whole wheat flour. 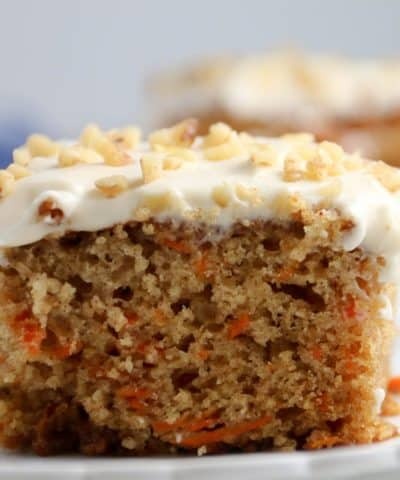 You can add in raisins, caraway seeds, even orange zest for a fun twist. This is an easy soda bread made with baking powder so it’s in the oven in under 30 minutes! 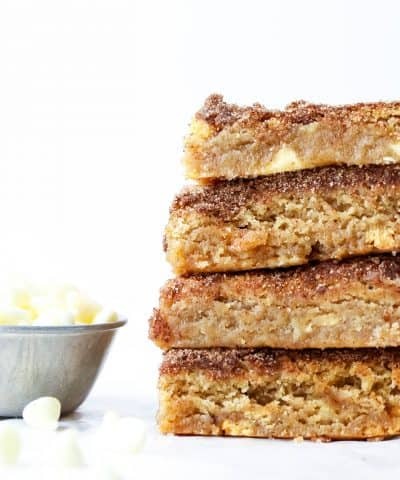 This recipe is also this month’s baking challenge. Keep reading to see how to participate! Is there anything better than homemade bread? I know. I totally agree. There isn’t. And there is seriously nothing better when homemade bread takes all of 30 minutes to throw together and is in the oven before you can say Bob’s your uncle. And traditional Irish Soda bread would not include any add ins like I used such as raisins, caraway seeds, and orange zest. 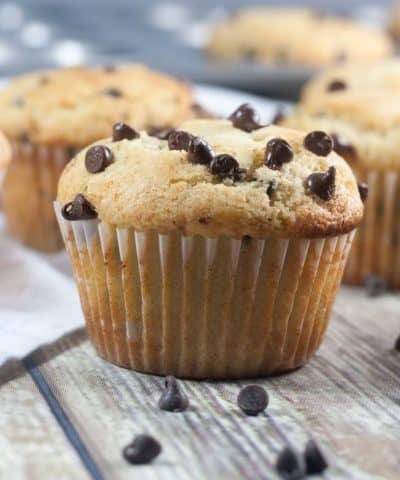 It is very simple – flour, leavening agent, salt, and buttermilk. Then there is the cross cut on top. Some source say the cross is made in the top to ward off the Devil and protect the household. (source: Abigail’s bakery). Others say it’s so that the bread can be divided easily. 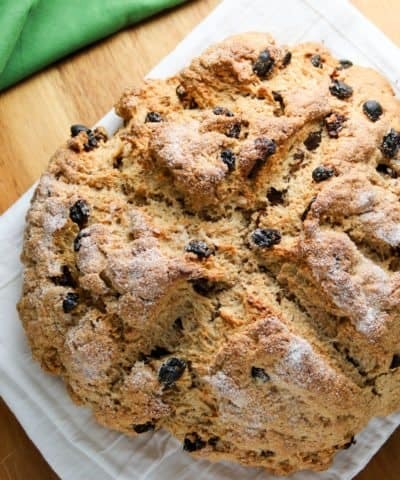 Making Irish soda bread is really no hard than making any quick bread recipe really. Like banana bread. It’s all about using a leavening agent. And of course not overmixing. Start by pre-heating your oven to 375°F degrees. Line a cookie sheet with parchment paper or a silicone baking mat. And you can make this bread in your stand mixer all in one bowl. After you have measured all your dry ingredients into the bowl. 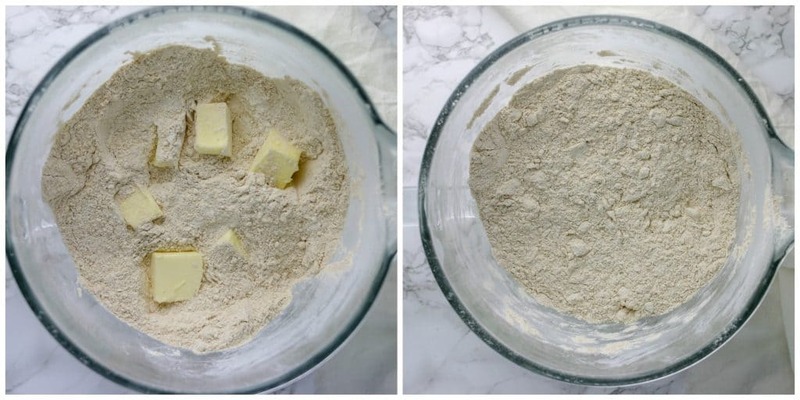 You want to add softened butter to the dry ingredients. Pro Tip: If you forgot to take the butter out early (I do this all the time, so I hear ya) then here are 3 fast ways to soften your butter. Once your butter has been incorporated, then add in your buttermilk and egg. Buttermilk has to give the bread such great flavor and moisture. If you don’t have buttermilk on hand, then you can make your own buttermilk at home. Now here is where you can have some fun. 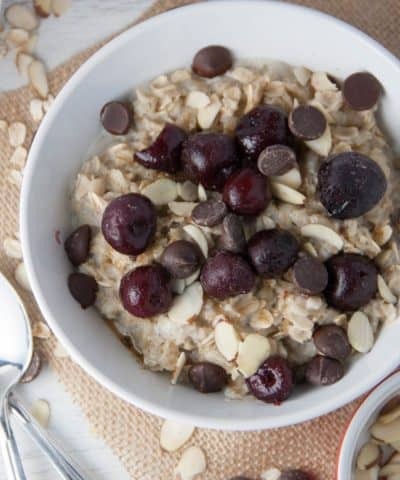 You can add in raisins. Caraway seeds. Even orange zest. I tried them all. My favorite combination was the raisins and orange zest. But do what works for you! And that’s it. 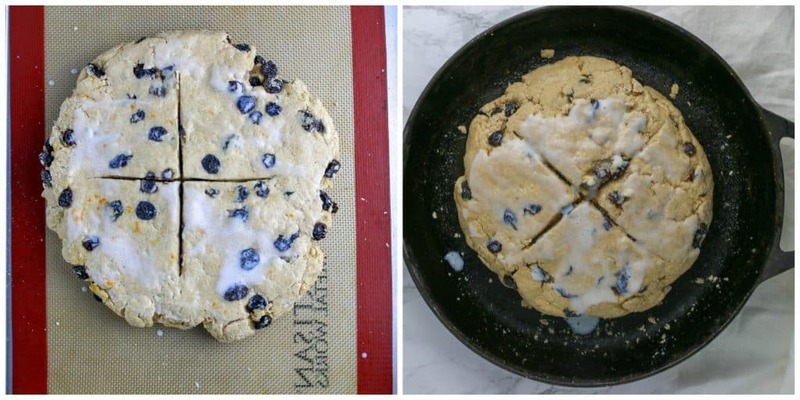 You just need to simply pat the dough into a round onto a cookie sheet with parchment paper or into a cast iron skillet. The cast iron skillet method will cause the bread to spread a little less. With a serrated knife, cut an “x” into the top of the bread. 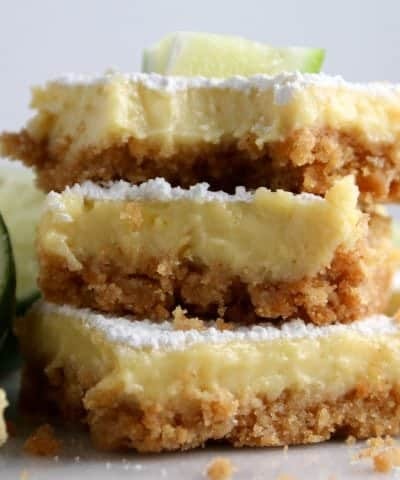 You can brush the top with a little bit more buttermilk or a sprinkle of sugar for a bit more sweetness. Soften your butter. Make sure your butter is softened so that it can be easily incorporated into the dough. You can let the butter sit on the counter for 3o minutes to an hour, cubed, for it to soften quickly. Here are 3 more ways to soften your butter quickly. Careful Measuring. Be sure to measure your flour correctly. Too much flour will result in a dense bread. I recommend first by stirring the flour before you start to measure. Then scoop the flour into your cup with a spoon and level off with a flat edge. Do not overmix. Because this is essentially a quick bread, meaning it’s leavened with baking soda and baking powder too much mixing can result in too much gluten being formed. And too much gluten will result in an overly chewy bread. I made a whole wheat version of this bread to make a bit heartier. And healthier I guess. Win win right? I used half whole wheat flour and half all purpose flour. You could all purpose flour if you want. 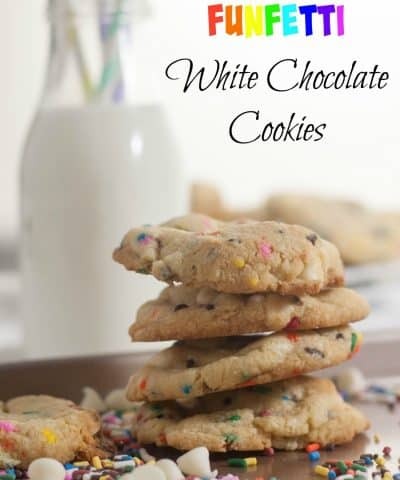 Or try using white whole wheat flour which has a softer texture than traditional wheat flour. I’ve used it before in my banana bread and you would never know it’s whole wheat! I don’t recommend using all whole wheat flour because of the texture. 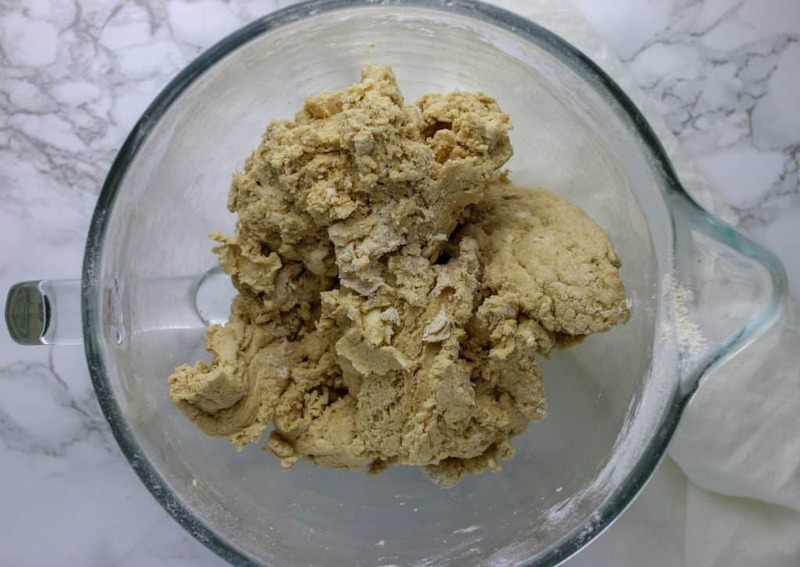 If you’re new to baking then you might want to check out my post on how to measure flour correctly and the different types of flour. This homemade bread recipe is so easy to make because it doesn’t rely on using yeast, but baking powder and baking soda. So no need to proof anything, wait around for it to rise, and shaping. And all that other jazz. Not that I don’t love a good loaf of artisan crusty homemade bread made with yeast. But sometimes I just need bread. Like now. 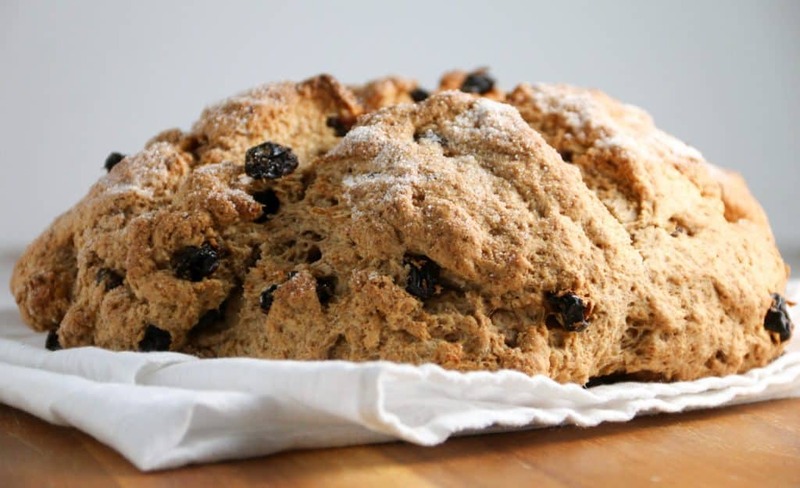 Irish soda bread can dry out quickly. So unless you are eating right away (which is what I recommend! With a bit of butter) then you want to wrap it up in plastic wrap or aluminum foil. It will stay fresh this way for 3-4 days. The bread can also be frozen for 2-3 months. Don’t forget to make this bread and take a photo to be eligible to win this month’s baking challenge. Click here for details on how to enter! 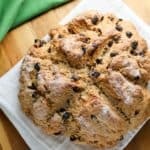 A whole wheat Irish soda bread that has a crusty exterior and soft center, made with raisins and orange zest! Pre-heat oven to 375oF degrees. 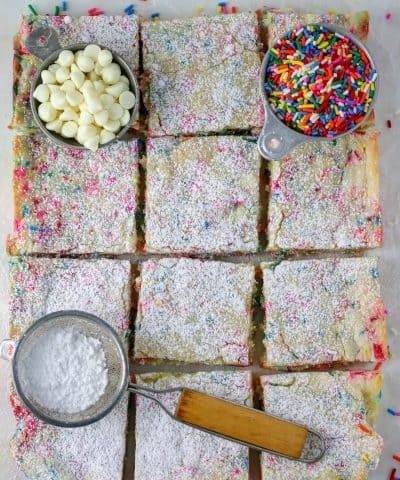 Line a cookie sheet with parchment paper or a silicone baking mat. Or you can bake this in a 10- inch cast iron skillet (which will cause the bread to spread less.) Or an 8 or 9 inch cake pan would also work. 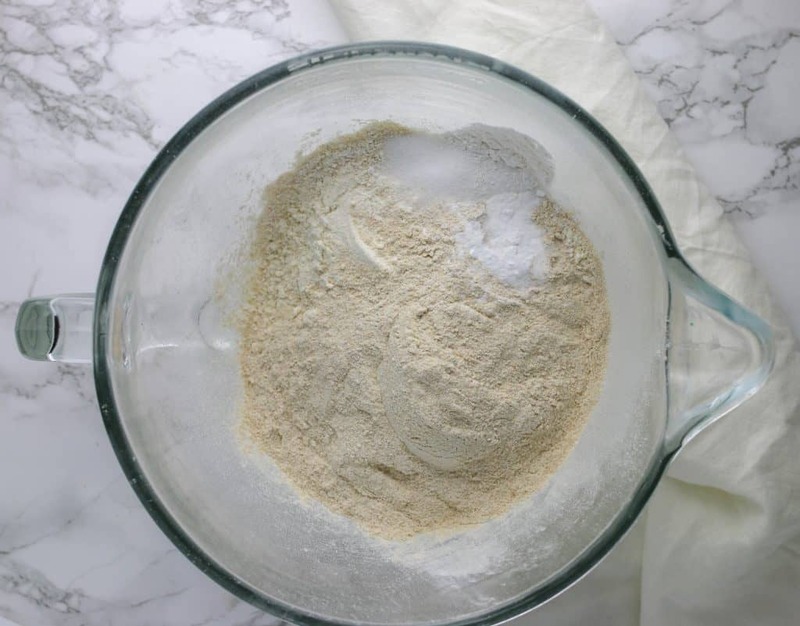 In the bowl of your stand mixer, add the flours, baking powder, baking soda, sugar and salt. Stir to combine. Add in the butter and stir to combine. Add the buttermilk and egg and stir to combine. 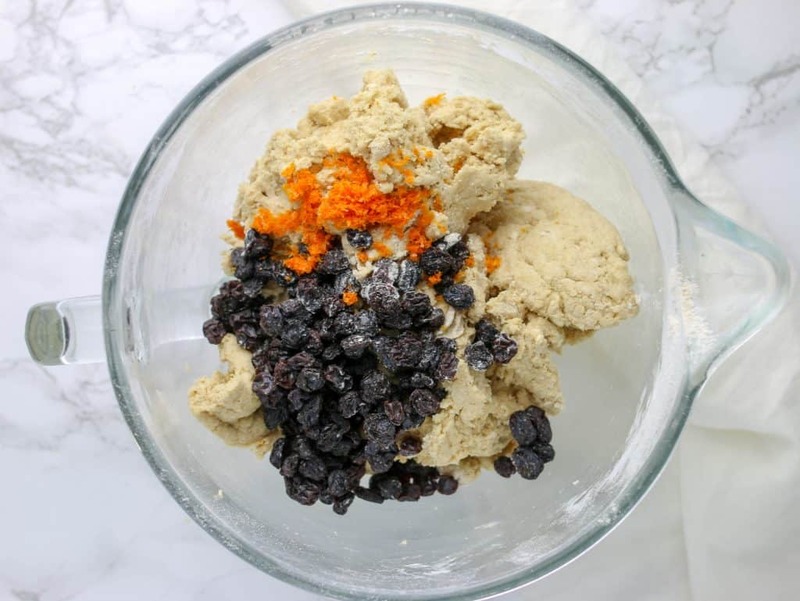 Add in the raisins and either orange zest or caraway seeds if you are using them. You may need to stir this in by hand with a spatula. Turn the dough onto your cookie sheet and shape into a ball. Pat down slightly into about a 8-9 inch circle. Brush the top with more buttermilk or a sprinkle of sugar. Using a serrated knife, cut an "X" across the top of the bread. Bake for 45 to 50 minutes until golden brown and internal temperature of 190oF. Cool on a cooling rack. Do not overmix. Because this is essentially a quick bread, meaning it's leavened with baking soda and baking powder too much mixing can result in too much gluten being formed. And too much gluten will result in an overly chewy bread.